Festivals and food are synonymous wherever in the world we go. It is food that’s at the centre of any celebration, and that makes us really happy. In India festivals resonate with Sweets, we believe in adding sweetness to the lives with an array of our irresistible sweets. The ladoos take a special lead when it comes to festivities and besan ladoo is a household favourite. 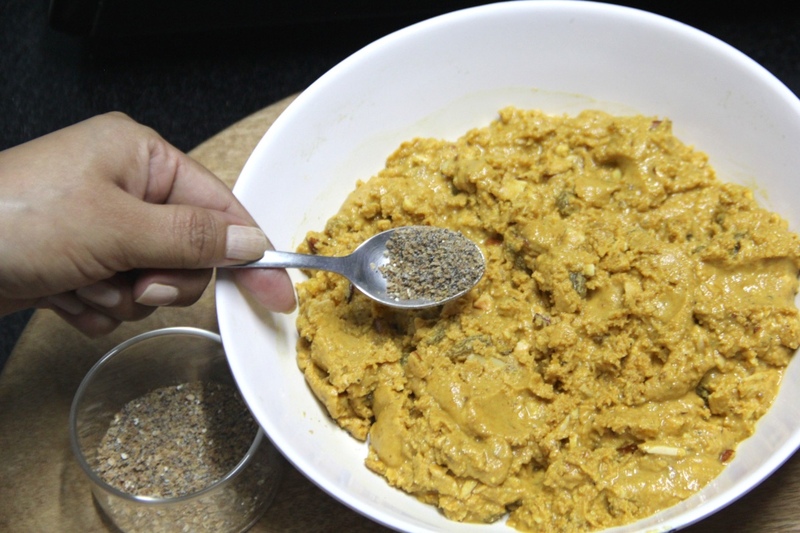 To learn how to make besan ladoo loaded with rich dry fruits and Gond read the recipe below. A few other festival favourites to try this Diwali are the Mal Puas or the Kaju Katli or Coconut Ladoo, or Gulab Jamuns or Orange & Coconut Barfi, the list just goes on , who can pick one. 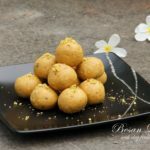 This is a delectable festive take on the besan ladoo recipe, though we already have an old recipe on how to make besan ladoo here, it is a much simpler version. 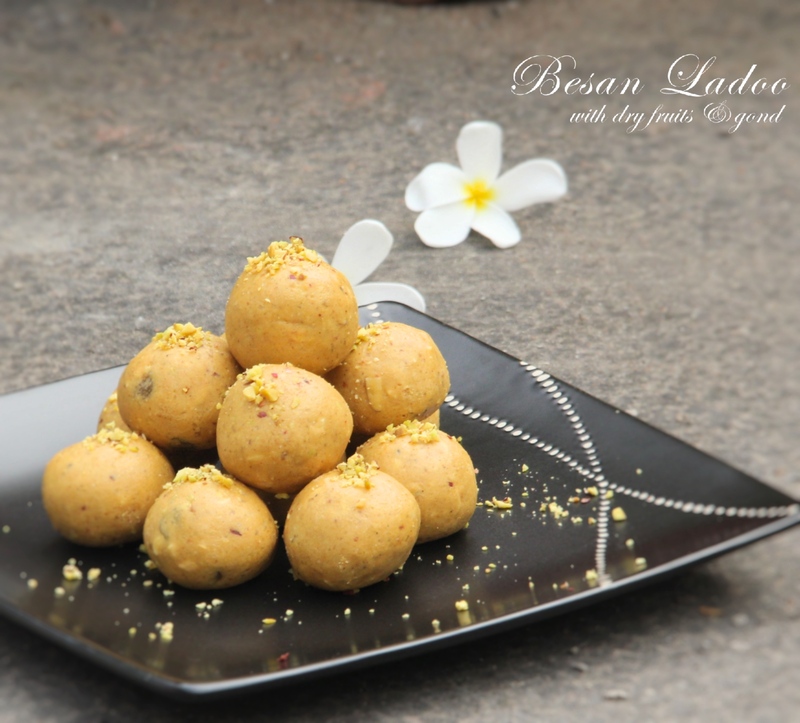 The besan ladoo recipe below, however, has excess of richness. This ladoo recipe is loaded with rich dry fruits and enhanced by the use of edible gum or gond which is supposed to be excellent to warm you up in winters and adds extra crunch to the ladoos. We’ve been away from blogging for what seems like ages, almost 2 yrs, but never stayed away from food. After much contemplation we’ve decided to restart, to bring foodpunch to life again. This seemed to be the perfect time to restart and re-ignite the fire with Festival special recipes to cater to the upcoming festivals of Dusherra, Navratra, Diwali and Bhaidooj. A perfect Indian festival sweet recipe, the Besan Laddo is easily made in few quick step. Just follow the step by step recipe with pictures given here. 2. 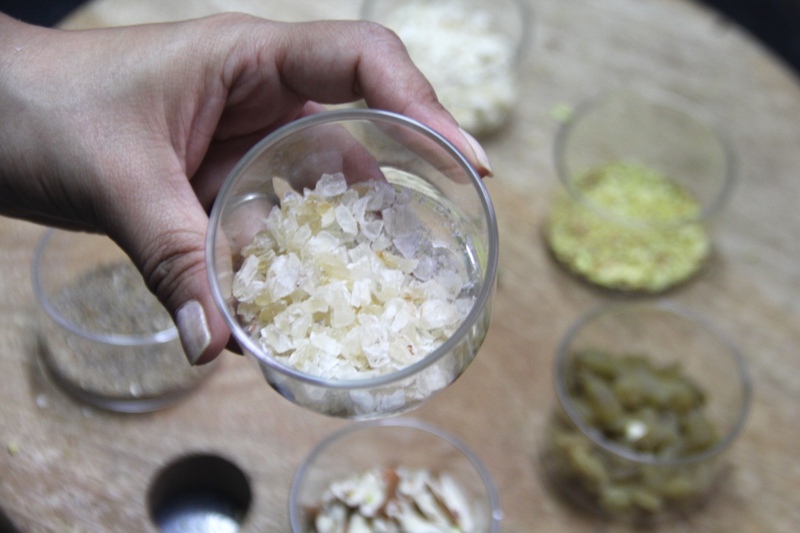 Break the edible gum (gond) into tiny pieces. Heat 1 tsp ghee in a pan and fry the edible gum until it pops and almost doubles up in size. Do not let it brown, drain on a paper towel and keep aside. 3. Now heat a large frying pan or wok, add the besan and fry for a min on low flame. Then add the calrified butter (ghee) and keep fryin on a low flame. 4. 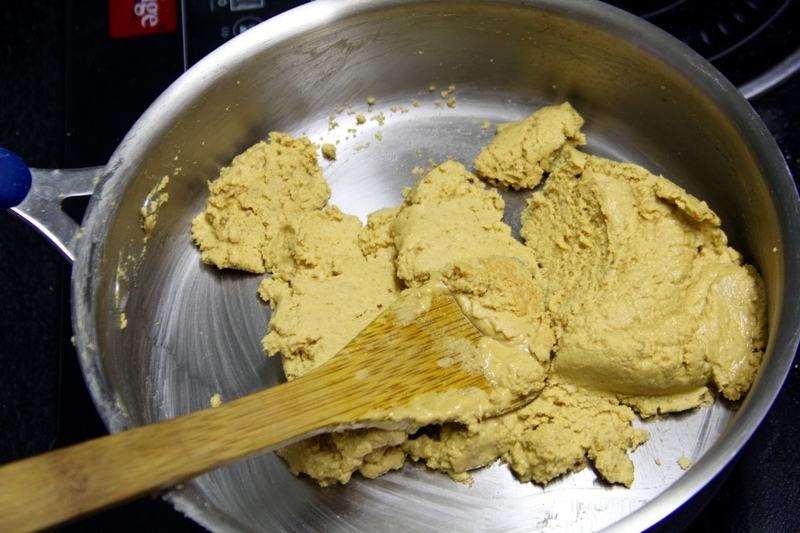 Stir continously until the flour is fragrant and the colour has just started to turn into a slight golden-brown. 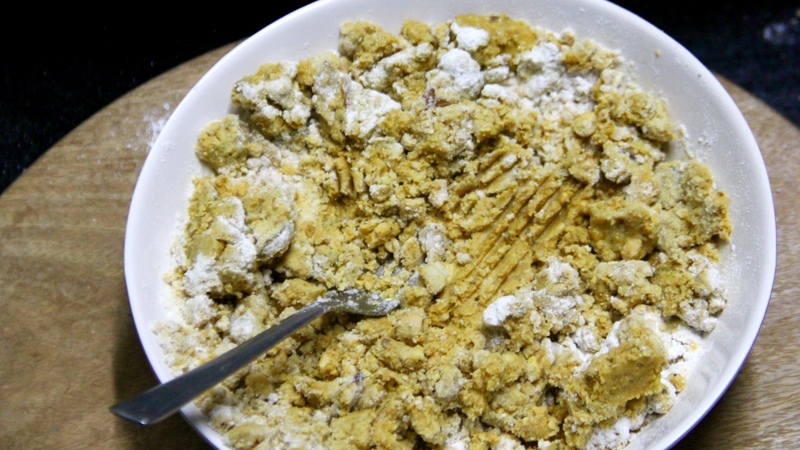 The mixture will turn light and fluffy when it is ready. Be careful as the carry forward heat will further darken the colour. 5. Stir in the chopped cashews and almonds. Then mix the roasted edible gum and turn off the heat. Mix the raisin and cardomom pwd and allow to cool. 6. Once almost cooled, should be just little warm, add powdwerd sugar and mix using a fork or get your hands in. 7. 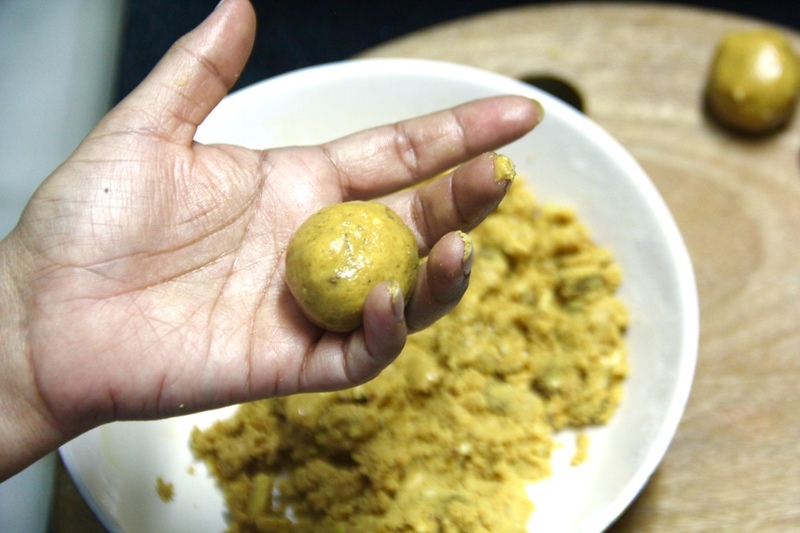 Then take a small amount in your palm and shape them into roud balls to make besan laddo. It would make about 20 medium size Besan Laddu. 8. Finally sprinkle fine pisatcio on top to garnish and the Besan ladoos are ready to serve. 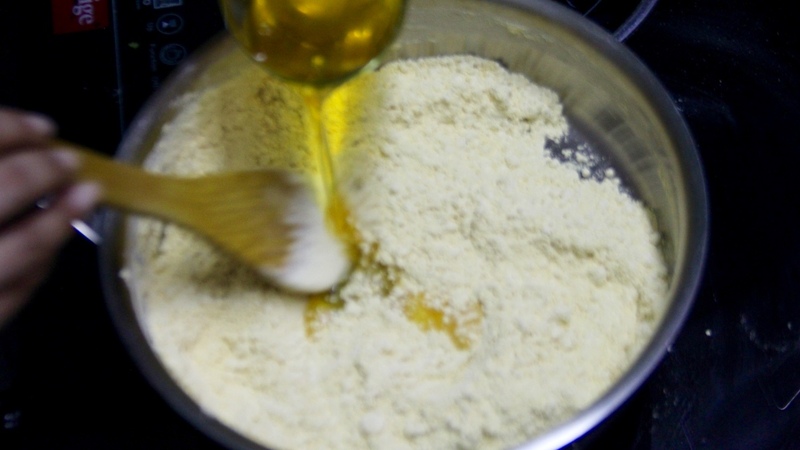 If a coarse flour is unavailable use a tbsp or two os semolina to add gariny texture. Do remember not to brown the mixture as the carry forward head will further darken te ladoos. Adjust dryfruits to your own liking. 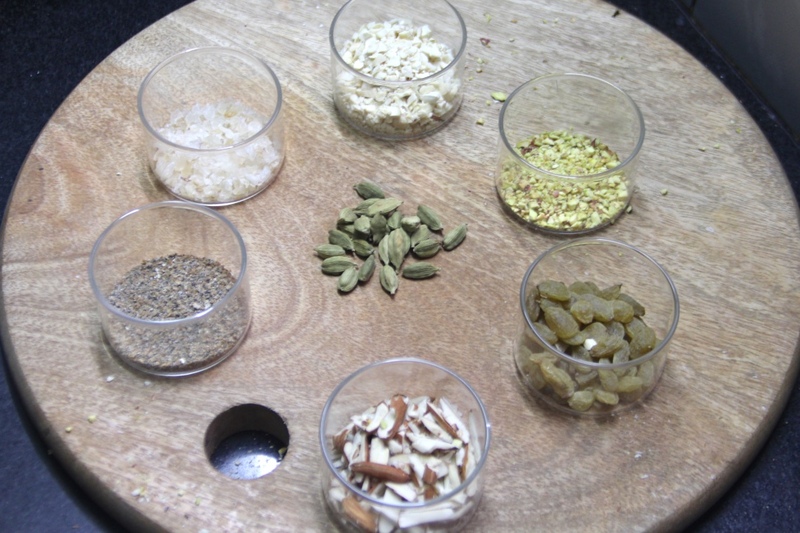 Start by chopping all the dry fruits and keep them aside. Break the edible gum (gond) into tiny pieces. Heat 1 tsp ghee in a pan and fry the edible gum until it pops and almost doubles up in size. Do not let it brown, drain on a paper towel and keep aside. Now heat a large frying pan or wok, add the besan and fry for a min on low flame. Then add the calrified butter (ghee) and keep fryin on a low flame. Stir continously until the flour is fragrant and the colour has just started to turn into a slight golden-brown. The mixture will turn light and fluffy when it is ready. Be careful as the carry forward heat will further darken the colour. Stir in the chopped cashews and almonds. 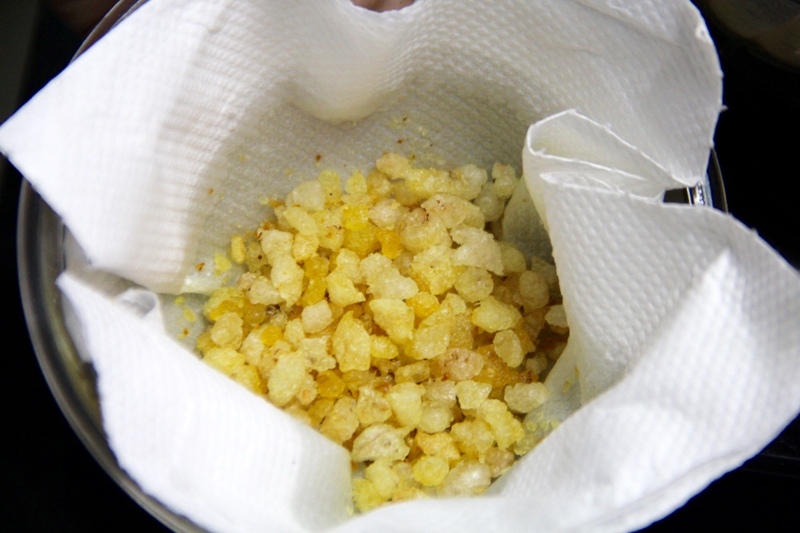 Then mix the roasted edible gum and turn off the heat. Mix the raisin and cardomom pwd and allow to cool. Once almost cooled, should be just little warm, add powdwerd sugar and mix using a fork or get your hands in. Then take a small amount in your palm and shape them into roud balls to make besan laddo. It would make about 20 medium size Besan Laddu. Finally sprinkle fine pisatchio on top to garnish and the Besan ladoos are ready to serve. Thanks a ton for the comment Shiwani. 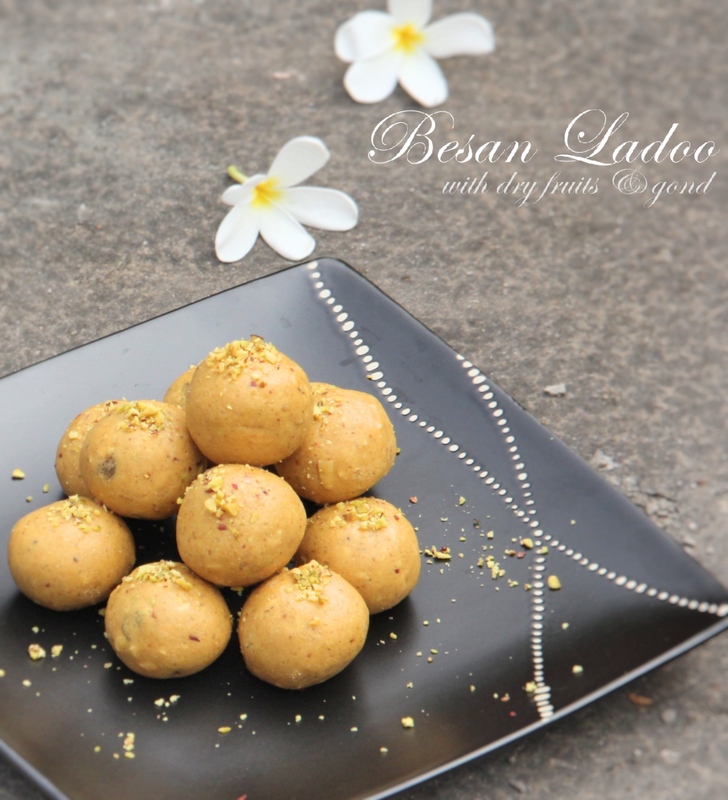 We absolutely love besan ladoo too.